I hope this is in the right section, but yesterday I was at Target looking through the halloween decorations and came across a small Star Wars Christmas section. So many cool things I can't even describe but I bought this decoration that you would place on a coffee table. It's very big and Is Boba Fett standing on snow. He has a candy cane in his hand that he is holding like he's gonna blast someone with it. I believe he has a santa hat on. Behind him is Hans Solo...frozen in carbonite and is wrapped in a big red bow with a Christmas tag that says " to Jabba" I will take a picture tonight and put it up tomorrow. Everyone to target!!! Here's a website of some of the ornaments. Right on. I'll have to be on the lookout for some. I did notice they already had the Halloween costumes out, and they had a pretty decent one of Boba Fett and another one of Jango Fett. I have Padme from clones that is the only thing that goes on my tree that is not black! 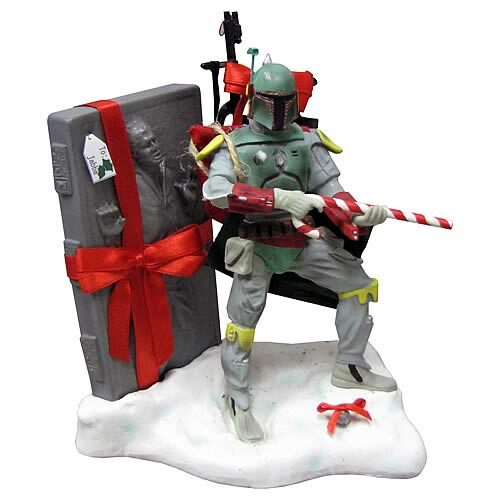 "All I want for Christmas is a Boba Fett, a Boba Fett, oh a Boba Fett"
Found a link with that new ornament Sintas. It's only a colored sketch drawing, though. I found some the other day at Target. They're by Kurt S. Adler. His company did several Fett ornaments last year. They didn't have a Fett one on this trip, though, so I'll have to keep looking. Thanks for the tip, though. Looks pretty neat. Some of the other ones in the series are pretty cool, too. Yaaaaay! That's the one..thanks for the picture Sadriel_Fett !! That is just flat out cool!!!!!!!!! Me and my BF were at Target today and saw the Boba one, and he bought it for me!!! On the "to" card, on Han Solo's slab....it says "To: TK-421." It's from A New Hope, after Luke and Han knock out the Stormtroopers and take their armor. The officer looks out and says, "TK-421, why aren't you at your post?" That great. Almost makes me want to celebrate christmas. For all those who never found one of these last Christmas, our friends over at Entertainment Earth have answered our prayers. It's Christmas in July this year!! o ive seen that online and in stores too (at xmas time obviously). Is it me, or is this about $30 more than what it was at Target last Christmas? Yes, 30.00 is more than Target was. I just went and checked mine that I bought last year, and it was only 19.99.